It is time to turn to state level polling for president. Obviously this is where the nomination is won (and mostly lost). While I believe national polling is valuable, it is Iowa, Nevada, New Hampshire, Florida and South Carolina that will set the stage for the nearly-national primary on February 5. So starting now Political Arithmetik and our partner site, Pollster.com, will be giving new and increasing coverage to state polling. See the links in the right hand column under "State Presidential Primary Polls". At the moment I am focusing on the five states that come before February 5. As more data accumulate for other states, those will appear here as well. 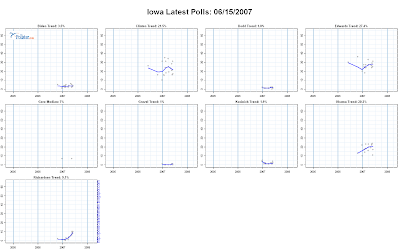 And of course each new poll will trigger an update of the graphs for that state. 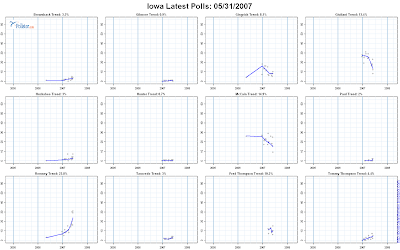 So what do we learn from looking at, say, Iowa and New Hampshire that we didn't know from the national polls? We see Giuliani and McCain experiencing significant declines, at least as large as their national declines and larger in some states. 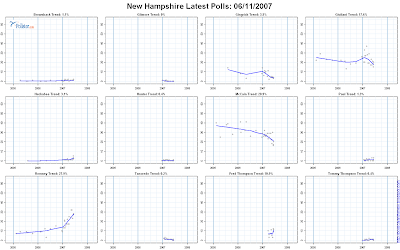 But the most interesting thing on the Republican side is the rise of Mitt Romney in both Iowa and New Hampshire. The Romney campaign and some of his supporters have been pushing this story for a week or two now, and the AP and New York Times have run stories in the last couple of days. But the degree of increase for Romney is striking even when stripped of the hype. In Iowa, the trend estimate puts Romney in first place at 23.8%, well ahead of the slumping Giuliani at 13.4% or McCain at 14.9%. Upward trend is being influenced by three recent polls around 30%, one of which is an internal poll leaked by the campaign, so that should be discounted. But two others find similar results. More polls come in between 15% and 20% so even if we dismissed all three polls around 30%, the trend estimate would still put Romney slightly ahead of McCain and Giuliani. Newcomer Fred Thompson has not shown the upward trend in Iowa that he has nationally and in some other states, so at the moment at least he isn't challenging Romney in Iowa. But don't be surprised to see Giuliani and McCain marginalized by plummeting polls in Iowa, and a Thompson-Romney contest develop. Romney has begun spending quite a bit on television ads, and that plus the rest of his campaign has clearly paid off handsomely in Iowa. McCain and Giuliani decided to skip the Ames IA straw poll on August 11, preferring to invest elsewhere. A loss to Romney there would be bad for either or both. But if these kinds of polling numbers hold into August, a Romney victory at Ames, even an uncontested one, will look awfully impressive. In national polls Romney has looked like the tortoise to other candidates hares, but that tortoise has been slowly but steadily creeping up in the national polls when Giuliani, McCain and Gingrich have all suffered substantial declines. Toss in IA and (as we'll see in a moment, New Hampshire) and Romney is looking far more impressive than he did a month or two ago when suffering a series of gaffes. If he can deflect the inevitable attacks on his ever changing issue positions (is it the water in Massachusetts or what?) and maintain this trajectory we will be in a great position for the fall. In New Hampshire, the picture for the Republicans is similar. The same upward trend for Romney puts him at 27.9% to McCain's 20.9% and Giuliani's 17.6%. Here again Romney is the only clearly upwardly mobile Republican. Thompson is at 10.9% with a little bit of a wiggle up but not enough polling to be confident of any conclusions. Romney's performance here can't be attributed to being Governor of a neighboring state. That was also true six months ago when Romney was at just under 15% in New Hampshire while McCain was at 28% and Giuliani at 24%. 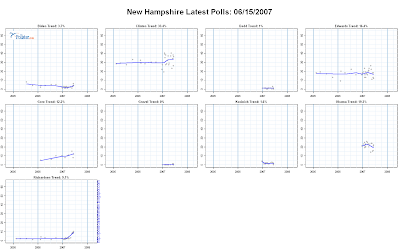 As with Iowa, the downward trends for Giuliani, McCain and Gingrich in New Hampshire do not suggest success. Clearly these campaigns must find a way to arrest their falls, both nationally and in these critical states. Let me be clear that I do NOT think the current trends are inevitable or are good predictors of what will happen next January. Remember always, John Kerry was at 9% nationally in December 2003 and headed down. BUT, these polls are an excellent indicator of the CURRENT dynamics of the races and whose campaigns are doing well and whose are in trouble. At the moment, Romney is the only Republican clearly happy with what is happening in Iowa and New Hampshire. Turning to the Democrats, we see much more stasis than in the Republican race, though with a very interesting exception. In Iowa, Edwards leads at 27.4%, with Clinton at 21.5% and Obama at 20.3%. Clearly a tight races. But compare the trends here to what we saw among Republicans. Clinton has moved down by about 4 points since April. But neither Edwards or Obama have managed to get any gains during the last couple of months. Edwards has been almost completely flat, and Obama is also unchanged in the second quarter. None of these looks like the substantial declines of McCain, Giuliani and Gingrich, but on the other hand they don't inspire confidence in an upward trajectory of the campaigns. Rather the three seem to be in equilibrium (and granted a bit of decline for Clinton.) This should be especially scary to Edwards who has placed a large bet on doing well in Iowa. That worked for Carter in 1976, but not so well for Gephardt in 2004. While he leads the race there at this point, and saw some nice gains in the first quarter of the year, it is disturbing that his trend has so completely flattened out. Far better than, say, McCain's situation, but still not what a frontrunner (in the state) might hope for. The most interesting trend in Iowa, however, is the rise of Bill Richardson. He currently stands in single digits at 9.1%, but is the only Democrat with a significantly upward trajectory. Like Romney, Richardson has debuted ads in Iowa and New Hampshire and it is possible to attribute his rise to ads that aren't being answered yet by any of his competitors. But the last couple of weeks have seen news articles saying Richardson is the big disappointment of the debates, a possible breakout candidate who has completely failed to break out nationally. True enough. But in Iowa (and wait for it-- New Hamphire, see below) Richardson is beginning to show the upward movement that previous success stories would look for. That said he is at half the support in the polls of any of the top three, so Richardson has a long way to go to become genuinely competitive in Iowa. But the stagnation of the top three campaigns in the second quarter, and Iowa's positive response to Richardson's ad campaign (and personal appearances) suggests that it may be too early to write this obituary. New Hampshire for Democrats looks a lot like Iowa. Clinton Leads by a substantial margin, 33.4% to Obama at 19.3% and Edwards at 16.4%. This is good news for the Clinton camp where a possible loss in Iowa could be blunted by a convincing win in New Hampshire. But the Clinton gains in New Hampshire came in the first quarter of the year, with substantial stability in the second quarter. Not by any means bad news, but not showing signs of increasing strength either. Shouldn't an inevitable candidate be showing signs of increasing strength? Obama and Edwards have both seen small declines in support in the second quarter. Hardly large and certainly not panic inducing. But again not what two insurgents facing the "inevitable" frontrunner would like to see. If Clinton is not showing the gains in strength she would like, Obama and Edwards are suffering from a failure to improve their competitive standing. And then there is Bill Richardson. At 9.1%, just where he was in Iowa. And with a very similar upward trajectory noticeably lacking for the other candidates. It is a very long way to go to January. Never, never, never will I suggest the current polls show how the race "must" end. But if I were in the Giuliani, McCain or Gingrich camps I'd be looking really hard for some debate points to reignite what look to be floundering campaigns. And I imagine they are smiling pretty much in Boston at Romney headquarters. For the Democrats it is hard to say the top three are in anything like the same trouble, but I'd be laying awake nights wondering what I have to do to move any of these three campaigns off the dime. Richardson seems to have capitalized on a nice pair of "job interview" ads to introduce him to Iowa and New Hampshire. Now can he continue to improve on the impressive gains of the second quarter to get himself out of single digits and contend seriously for third place? Or is TV fame fleeting, and this gain won't last? Very interesting. I think I'll stay tuned to the next episode. P.S. South Carolina is very interesting too, and rather different. I'll post something on it tomorrow, but if you can't wait, just click here to see the data and come to your own conclusions.